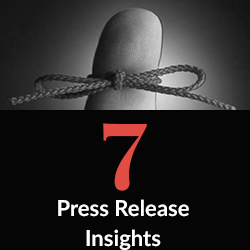 7 press release insights comes from Pr-Public Relations founder, Joanna Jana Laznicka, in a behind-the-scenes interview on a dark, stormy night when Joanna was in the mood to reveal some of the industry’s insights after a few glasses of fine white wine and a soak in her salt-water Jacuzzi. Here are the interview questions that made Joanna finally sing with press release insights. Should a Press Release be sent to an industry analyst? JL: Absolutely. Sending your press release to an industry analyst can help build newsworthiness with future clients or attract the press to give your business future positive word of mouth. When choosing a PR firm, what are the key factors we should consider? JL: Look for a firm with product knowledgeable staff members and industry veterans who are already familiar with your industry. They are hard working and are already knowledgeable about most industries. With just a minuscule amount of research, and tips from your competitor’s press releases, a skilled staff writer is in a better position to enhance your press release. If we are writing our own press release, should we include a picture with our Press Release? JL: Yes, not only does it help give you more coverage, it enhances your press releases appearance. Make sure the dpi is set at a minimum of 300 dpi. The 600 dpi is the most popular measurement to use. An insider’s tip: upload the picture to your web server instead of sending it as an attachment. Many attachments have picked up viruses over time, and some editors won’t open them. What is the suggested format used for Press Releases? What do we do with our Press Release once it’s written? a) Levels of priority should be determined. (example; Level1, Level 2, Level 3) Note; Level 1 and Level 2 are mainly used for Business wire and PR Newswire. b) Areas of interest should be included to attract editors and reporters. c) Distribution lists; when selecting these, pay attention to the geographical area, publications, and media that will receive your published press release through the wire’s distribution service. Should we use a wire service such as Business Wire, Market Wire, or PR Newswire? JL: Focusing completely on wire services is not recommended, and is not as effective as sending a press release on a direct route to your editor. Although it gets published in several places, and saves time, not many clicks or sales get added to your company’s website. 7. How many editors should we send our Press Release to? JL: Send a copy to all editors who write about your press release industry. Target bloggers, television producers, analysts, editors, and radio hosts whose focus is on those targeted industries.